« Pruitt launches science bomb: insists EPA only use data that is public. No more secret science. The voters smacked the Greens yesterday, so today the Greens smack the voters. Richard Di Natale, Green Chieftain, blames the recent spate of storms and fires for the governments failure to change the global weather. The Greens have blamed the federal government’s failure to address climate change for a cyclone and bushfires which have ravaged communities across Australia over the past 48 hours. Cyclone Marcus has swept across the Northern Territory, bringing down power lines and hundreds of trees in what Chief Minister Michael Gunner described as the biggest storm to hit the Top End in 30 years. In Tathra on the NSW South Coast, at least 70 properties have been destroyed, while thousands of hectares of farmland, livestock and 18 homes have been lost in four blazes which were started by lightning strikes across South West Victoria. In an anti-coal speech in the Senate today, Greens leader Richard Di Natale said the government had been doing “everything it can to slow this country’s transition to renewable energy”. Four thousand IPCC-Chief-Gurus said cyclones will become “less frequent” but “more intense”. Which is why Cyclone Marcus was a Category Six … Two. Marcus had gusts to 130km/hour, thankfully, no buildings fell down and no deaths were reported. ABC News Darwin after Cyclone Marcus. 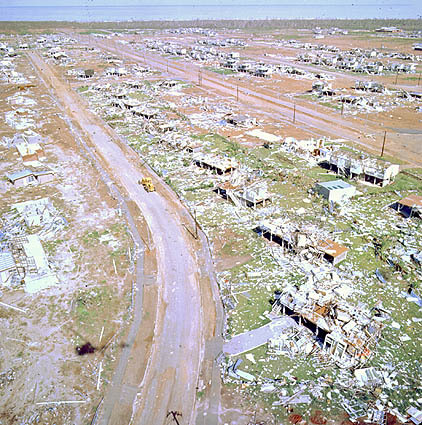 That 1974 pre-climate-change storm had gusts to 240 km/hr, razed 70% of the town and killed 65 people. Evidently climate change causes stronger buildings, or perhaps that has something to do with fossil fuels? But this week in Darwin the local hardware stores have run out of chainsaws. Forty three years ago they ran out of walls. Tomorrow: the Climate Druids lecture us on Fires. *Thought for today: Looking at the cyclone trend graph – ponder if we are returning to the cooling period of the 1950′s-70s? It’s possible we may get more storms again, but for the opposite reason. As it happens another cyclone may already be on the way? You can present all the relevant facts you can find (there’s a lot) but they will never be recognised or acknowledged by those that truly believe in the CO2 demons. When its politicians pushing a party policy or meme designed to present a front for the public is one thing but getting one that wholeheartedly believes it is simply dangerous. Di Natale’s chest puffing about sabotage is not just about political self survival its the recurring behaviour of people that desire power to rule others not to serve them. …or put another way….educated people should know better…tsk…. The real problem is there is NO ONE in Parliament to call out De Nutter for misleading the Parliament, lying to his constituents and crapping on the Australian people. We can blabber and blogger all we like here and NOTHING HAPPENS! We NEED someone in Parliament who has the information, the brains and the guts to stand up to these doomsday CAGWatologists and force them to put up or shut up with cold hard facts and data. Agreed, although the SA result may indicate a change in the prevailing wind direction….. Speaking to some friends who have a wide sphere of influence, i explained the SA debacle and the big SA battery, and how much ( of eye watering proportions ) money it would cost for a power station sized battery, and how the greens have almost succeeded in orchestrating a ban on internal combustion engines in 2030 and how they are stopping selling petrol chainsaws after 2019….all you could hear was jaws hitting the floor…..followed by dark mutterings into beers and chardys…. Now this is talk in pubs. The loony left can rabbit on as much as they like, when your average voters eyes narrow in anger they can run butvthey cant hide…..
CoIA so true its not funny, but its not even so much the problem of getting a good candidate but getting the (honest) exposure of them through the MSM so the public can see a true alternative (think Australian Conservatives) option that will be good for the country and them. Take into account just how much Australians rely on and look to the government for everything in their lives, even heard an ad for government approved super sacrifice for home buyers so now they want to manage finances for taxpayers?, the ever overreaching arm of big government always starts out as looking to assist people which offers comfort and security for some but as those schemes grow along with dependency so does apathy and loss of personal liberties. What? no eye of newt? I’ve heard it works wondes against cyclones. When Burnham wood comes to dunsinane, we could see a change in their behaviour, so to speak…. I hope Birnam Wood is not in a Green controlled council region as Malcolm would be prosecuted for cutting down trees without council approval. Yet another example of Green extremism. Just a bit of look! squirrel!! from the Greens , hoping people get distracted from the Grenns own ineptitude and irrelevance. We were utterly disgusted by Di Natale’s blethering…it was completely tasteless, but typical of those seeking to bully others into accepting their climate fairy-tales. So why does increased CO2 produce more and more extreme weather events? What is the logic? Where is the proof? What is the scientific explanation? This is the most outrageous claim of the panic merchants. Fabulist Faux scientist Flannery even says that droughts will become longer and more frequent, which means they will join up and be less frequent. You cannot have more an more droughts. They would have to become shorter. However to the merchants of doom, Delingpole’s four horsemen of the ecopolypse, there is no claim too outrageous, no unjustified claim too far. What happened to those rising seas? Forgotten. The vanishing polar bears, still the poster animal but the stories have stopped. After thirty years of the day after Tomorrow, who believes these claims of vanishing islands and Bangladesh under water? What is amazing in a world of high natural variation anyway, is that the claims which had a 50/50 chance of coming true have all been wrong. Clearly the building hundreds of thousands of windmills has stopped warming, reduced the frequency and strength of hurricanes/cyclones. It’s about time Green leaders like Di Natalie start taking credit for improving world weather, cooling the planet and reducing storm numbers and strength. Except that even they know it’s rubbish. None of it is true. It’s all about political power and the steady wage, the travel and the great superannuation. Di Natalie’s salary alone is $283,000 a year. The retirement benefits are unjustifiable with retired politicians on an indexed $250,000 a year plus varying free plane flights plus indexation. Why? TdeF, they don’t use proof – I doubt they would even know what it is – they rely on feelings, belief and groupthink and get all upset when rational people dont. TdeF: you forgot about snow becoming a thing of the past and ever more early end to winter in England and other parts of Europe. Then there was the Ship of Fools getting iced in when the researchers were meant to be chronicling shrinking ice sheets. Yes, that was funny world wide. The Climate Science actors did not believe the photographs showing sea ice were accurate. They really believed sea ice was a thing of the past, never to return. It was not meant to be able to quickly trap and crush ships. The cost and risk were both horrific and I presume we, the Australia taxpayer funded this dangerous escapade costing millions, wrecking summer supply for many countries and endangering many lives and interfering with real research by real scientists. A lot of people also accept without thinking that melting sea ice makes seas rise. It doesn’t. Try it yourself. Add ice to glass, bring the water to the top and wait 20 minutes. The water does not overflow. All the sea ice at the North Pole could melt and the water level would not change. To be fair it is the Greenland ice they worry about. But is that melting? Apparently not. There was a flight of P 38s lost in bad weather which landed on the ice in Greenland so we have an exact date, July 1942. One, named Glacier Girl was recovered 50 years later but the extraction wasn’t easy, it was under 82 Mts of ice. I find the argument that Greenland is losing ice cover to be unlikely. Then there is Antarctica, the size of South America with an average height of 2500 metres (7500 feet). Maximum temperature in summer, -25C. Melting, of course. All the fault of the infernal combustion engine and those tiny, tiny people. Sorry, to be fair, 8200 feet average. The central plateau has as diameter of 1,000km (600 miles) and an elevation of 3,000 metres (10,000 feet). Somehow it is all supposed to melt. In fact it is growing. Logic, TdeF? Who needs logic? As you have said: It’s all about political power and the steady wage, the travel and the great superannuation. Instead of just trying to refute the Witch Hunters, we have to start laughing at them. Openly and publicly. That they can’t stand. A small price to pay for his outstanding contributions to Australian public life. Do I really need a /sarc? Unlike South Australia that is pretty well protected from bushfires because of all their wind farms, despite the warnings of the Greens, NSW is still very vulnerable to cyclones floods and fires by relying on coal-fired energy. Seriously, The Australian today has tried to set the record straight today by countering Senator Hanson-Young’s hysterical: “some coastal areas were 39 degrees yesterday at the end of March” by pointing out that Sydney’s hottest March day was on March 9, 1983 with 39.8C. In fact on Sunday Bega’s max T was 38.4C at 3:00pm while the maximum March temperature recorded at Bega (’69 -’94) was 41C on March 7, 1983. I suspect the people are beginning to finally realise this. Obviously, the MSM party et al. have a long way to go before they come close to a restoration of the canons of journalism or ethics in politics. Take heart and comfort. It’ll be the post-millennials that step up to the plate to save themselves from the receding tide of prosperity and development, and the throttling by inhuman and inhumane diktats. Their early mindless indoctrination about guarantees it. Just take a look at some of the post-USSR European countries now. When socialists talk of peace for those who oppose them, they mean the peace of the grave…..
Lord Monckton has my admiration in that he pushes the falseness of the Man made global warming claims. He does love the maths, however, and the two main issues, if addressed first could remove the need to assess all the models and equations. First, CO2 does nothing to heat our atmosphere. Let the warmers demonstrate experimentally the truth of their science. Second, even if CO2 in some unforseen way, did have some small effect, there is a major stumbling block. Human origin CO2 is only about 4% of atmospheric CO2 and is therefore of no concern compared with the effect of nature. The basic CO2 mechanism is not there. How can it “heat” the atmosphere? The reality remains. In a post-modern, post-truth, cultural-marxist, Alinsky cultivated, precautionary, propaganda hijacked, freedom and prosperity crushing age, we have seen that there is no prima facie requirement for empirical evidence, merely the doctrine of settled politics. There is no question. The sooner this toxic melange of settled politics becomes unsettled, the better. And among other things, humour provides an excellent repost, one of those many human qualities wholly and revealingly absent from the daily Leftist polemic. Take this cartoon for example. society in your desired totalitarian mod. Polarize people on political, economic, religious or environmental grounds,do whatever it takes, Rule 9, ‘The threat is usually more terrifying than the the thing itself,’ .. lotsa’ fear and guilt. Monckton the Mathematician claims to have found a basic error in the calcs of feedback [I think]. Above my pay grade but he and others published a peer reviewed paper that seems to have sunk without trace. I love him because he gets up the collective noses of the alarmists. It’s more a misapplication of it. There is indeed much more wrong because feedback has a time dimension. The scalar climate models assume that all feedbacks add linearly over time and are not dependent on temperature or on anything affected by temperature. That’s not remotely true and the traditional feedback equations can’t be used. Climate models are like using the DC condition of an amplifier to determine the AC behavior. It’s just wrong. Time matters. Climate science implicitly assumes that the behaviour of the air is independent of the temperature and that you can vary the temp while holding all other factors constant, IE all other things being equal…. but engineers know all things are never equal. Has anyone pointed out to dN that the 2015-2016 cyclone season in Aus was the quietest season since official records began in 1969 with only one Cat 2 making landfall – Cyclone Stan? It’s time to place the Greens along side the flat earthers. They are bonkers in the extreme. Completely unscientific, illogical and plain dumb. Can we classify them as a radical organization? Greenpeace was stripped of its charity status in India due to its behaviour…. A few years ago The Weekend Australian quoted former Treasurer Peter Costello who had recently returned from a trip to Europe where he met a former German Minister for Foreign Affairs who is a Green. Costello was not willing to quote his contact’s full advice but in part the Australian Greens were described by him as way out to the left of international greenism. Some years ago The Flat Earth Society came out in support of AGW. There was a suggestion that they had their tongue in cheek as they were obviously too sensible to believe in AGW. … and De Nutter’s speech demonstrates, unequivocally, that they should never, ever be allowed anywhere remotely near the levers of power. Why do the Greens get any publicity at all? They have virtually no influence on real life. That’s because there are many people who are very gullible, non-thinkers, evil and/or dumb. There is very likely roughly a similar proportion of extreme right wing supporters in our midst who would not hesitate to vote for a neo-Nazi party if given a chance. The concern I have wrt the Greens though is they have for far too long retained a certain amount of respect and tolerance among the MSM and the ALP here. I can understand the ALP doing it for political reasons but the MSM is not so easily explained away. I can only come to the conclusion the MSM who support the Greens are equally very gullible, non-thinkers, evil and/or dumb. Be careful what you assume. I have met a lot of skeptics but I don’t know one that would vote neo-nazi. According to history they are not mere assumptions. The Germans supported Hitler in droves because he was a great speaker who won over the masses. Be careful of leaders who talk really well. In Greece the Golden Dawn Party is gaining ground. They are the third largest party with some 7% support. Although the Australian branch is not so popular it is here. None of its members as far as I know have been put up for election. Germany is seeing a resurgence of right influence. The Reichsbuerger movement over there is seeing growing support. Ignorance is bliss but it’s also risky. We don’t ever want to repeat history, but unfortunately it tends to do so too often. All it takes is another right wing leader to become popular in Europe and here we go again. Let’s hope it doesn’t come to that but I can see the warning signs already. Amazingly, one of the major reasons Germans supported Hitler was Stalin. His mass starvation of the Ukranians in the Holomodor in which 8 million died, his concentration camps, his mass exportations and his decimation of his armed forces were enough to convince conservatives and even Catholics to side with the strong man. They wanted someone who could defeat Stalin without realising that Stalin was his model. TdeF has it right. But it was more than just Hitler’s public speaking, He was telling the people what they wanted to hear. The social and economic conditions of the time were not good. Hitler’s oratory presented solutions everyone wanted to hear over and over. It was the big German landowners and industrialists (the Junkers) who backed Hitler with money. The working people wanted jobs, the Junkers wanted to keep their land and the industrialists wanted to keep their factories. From those perspectives, the Nazis looked very attractive. Everyone wanted the economy to be gotten working again. Jobs meant money. Money meant food and shelter. That was what was being promised by both the Nazis and the Communists. The German Communist Party was making plenty of traction with the unemployed (the 1920s had not been kind economic times in Germany). The German “Establishment” were desperate to keep the Communists from gaining power. Stalinist Russia was too good an object lesson with its nationalised land (collective farming) and industries and Stalin’s War on Dissent. So the money flowed and the Nazis benefited and the people cheered. Hitler would restablish the military. That would give engineering industries a big fillip, and the army navy and airforce would soak up what of the unemployed youth the business establishment couldn’t, giving them `discipline, training and a purpose.’ (No, nothing’s changed!). Nobody wanted the Weimar Republicans. They were seen as corrupt and ineffective. Germany had not had much time with democracy and nobody really knew how to make it work. So it didn’t. The other strange stuff the Nazis were preaching fitted popular preconceptions of the time so little thought was given to it. The main things were jobs, work, employment, production, and shelter. Dachau and Buchenwald (and others) were established within months of the accession to power, years before the invasion of Poland to house the `enemies of the state’ in good totalitarian style. All correct. He also promised many things. He lied. For example a car for every family and an annual holiday. So he demonstrated the Volkswagen, the people’s car, but they were designed as dune buggys with air cooled engines for North Africa. None were made for the people. He built huge holiday camps on the Baltic and made films about ordinary people enjoying their holidays. These were never used by the people and only now are being rehabilitated for actual use. Many top people enjoyed his patronage, Dr Ferdinand Porsche for the Volkswagen and various tanks/panzers. As a former PR man, image was everything and the impressive uniforms were designed by Hugo Boss. Everything was perverted to his plan but the workers were told lies and all the taxes were channeled into his war machine. His backers like the Krupps, the world’s biggest company were rewarded with government contracts. The Ponzi scheme would have fallen over without the spoils of war. Now the Green machine, the Green and banking industrial complex is doing the same for windmills and solar panels and shutting down Western democratic countries including the US and Australia. All supposedly to save the planet, not less but few in possession of the facts would believe it for a second. There is no science and a pretend enemy, alleged global warming of 0.5C for ten years and not since. And like the lead up to WW2, Australia & the West has a moral vacuum ( as we see what seems to be an engineered attack on Christianity, which is the framework for most of our laws ) and people looking for anyone to lead them out of the confusion and chaos that is now sweeping the world. In many ways while we don’t have a financial crisis like the Depression, we do have a systemic crisis of everything, with chunks of our way of life going to hell in a hand basket quickly. In such times, people will become desperate, and in those times the impsters will surface and speak great things to mislead people, just like Hitler did….. I doubt individuals in the media are evil. Or dumb. The viral debate with Jordan Petersen and Cathy Newman made a very good point at 22:52 when he compared the thinking, the phlisophy to that of Mao Tse Tung or Stalin, that all that matters is the side, the herd and that leftist ideologues are authoritarian, even totalitarian. It is the same philosophy which ended the lives of hundreds of millions of people. They were on the wrong side. One should be reminded that the Nazis can from a SOCIALIST background !! Granted they were/are socialist but it was a different form of socialism – nation socialism as distinct from Marxist/Stalinist socialism. They are poles apart and they hate each other with a vengeance. To distinguish them it is commons to refer them as right versus left, although to me these terms convey very little meaning. For example, the nationalist socialist Golden Dawn Party in Greece and here is considered a far right-wing party, although they consider themselves as centre-right, which is misleading. There was little difference between the two examples of socialism. The racism, misogyny and homophobic was there and communists highlighted it but some people just want to pretend it never happened. Wrong. They called themselves Socialist to win popular support. Calling themselves totalitarian thugs while honest, would have been totally counter productive. They weren’t stupid, and it’s a big big difference between calling themselves `socialist’ and being socialist. If ever a philosophy was the opposite of socialism, the Nazis exemplified it. Correct, which is why using terms like left and right albeit are sometimes misleading, still have some use to distinguish so called national socialism from Stalinist socialism, which are poles apart. Its kind of a moot point – all socialism IMHO is unhinged…. I used to think that greens were sincere but ignorant and radical. Not anymore. CAGW if not a green belief, it is a green tactic to bring on one world governance. And this type of governance would be a socialist or communist and a tyranny that would get worse with time. It would get worse because they would be so worried about a revolution that they would use any and every way to eliminate those who disagreed. The murders would be on a scale we have never seen as the elites strove to reduce the global population by billions. As far as I’m concerned the Greens are as evil as any extreme right wing party. Both types have one main thing in mind – the complete subjugation of the people. I like to think of it as a circle rather than a straight line. …and they meet at the opposite side of the circle from rational centrist thinking. I was only a kiddie at the time (9 years old, going on 10) but I remember the aftermath of Cyclone Tracy – and we lived in Tennant Creek at the time! I remember Mum & Dad making massive plastic buckets full of coleslaw, and hundreds upon hundreds of sandiwches, to help feed the huge numbers of people passing through Tennant Creek on their way to Alice Springs. These days, some Jobsworth would probably slap a health code violation on them because the margarine didn’t go all the way to the edges of the sandwiches. When I saw the news last night about the ‘devastating’ cyclone in Darwin, I noted (loudly,) that they made no mention of Cyclone Tracy. I immediately pulled up some pictures of what actual devastation looks like, and showed them to The Lovely. She had a vestigial memory of something called Cyclone Tracy, but in her defence she was only 2 when it happened. A few trees were downed in Darwin, a bunch of people lost electricity. Nobody died. And di Natale tries to sell this (and a bushfire FFS) as caused by cow farts and vehicle exhaust. I should’t be surprised at that level of charlatanry – he’s a politician after all, and therefore part of the very worst 2-3% of people in society (I would prefer that anyone who lives their life at taxpayers’ expense – including anyone whose wage is paid out of the tax take – not be counted among the term “people”). If bush fires are becoming more frequent and more severe as the Greens fruit loops suggest. It has nothing to do with climate change, (primarily natural), and everything to do with a lack of hazard reduction burning, (prescribed burning in WA), a practice which the GREENS vehemently appose. While ignitions will always occur, be they natural ignitions from lightning, or caused by man, it is the ability to control the fire that results from those ignitions. The more intense the fire, the more difficult it is to control and suppress, and the greater the risk it poses to those involved in suppression activity. Many hazard reduction burns have been successfully apposed by the greens. The inevitable result of this is an increase in fuel level both on the forest floor (litter) and in suspension (suspended fuel) in shrubs and trees. It is an immutable physical law that the more fuel available to a fire, the greater the thermal energy produced by the fire. This results in a stronger convection stream and the further embers are thrown ahead of the fire starting spot fires kilometers ahead of the main fire. This all makes such fires more uncontrollable, and a greater risk to firefighters, civilians and infrastructure. No Richard Di Natali, these fires were not the result of climate change. They were the result of your policies, and of the Greens ingrained hatred of the environment and the people that live within it. Yes TedM, exactly so…put the blame on the greenies who bullied everyone into policies that make bushfires much more dangerous. It’s the greens who deserve to take the blame. We have had a fire nearby that happily is now fully blacked out…it took almost a week of hard expensive effort. This one seems to have been caused by some campers (deer hunters?) Who made a hide and left a still hot campfire last Monday. If that fire had not been controlled there would have been another disaster around here with everything currently very dry and the roadsides in a disgraceful overgrown condition. After Black Saturday, had there been a proper will to do it, the roadsides could have remained flattened and grassed (fit to mow) and good trees allowed to grow up tall with cleaned main trunks. As it is, they are covered with nine years’ growth of scrub and look dreadful as well as creating a fire hazard with the local council cutting only a metre or so from the edge of the road. Ah yes Annie but you can’t remove the “Significant Roadside Vegetation” doncha know, after all how are you going to make life more dangerous for rural types that need to be saved and encouraged to move into allocated dwellings along the Smart Growth Corridors? Yes Yonnie. A lot of our ‘significant roadside vegetation’ is overgrown weeds that collect all the rubbish the tourists from Melbourne think we want adorning our area. Someone tell RdN that the biggest bushfire ever recorded in Aus was in Victoria in 1851 – 5 million hectares burnt out (which is about 25% of the state). Too true Ted. Several years ago Warrumbungles National Park, central NSW, had a devastating catastrophic fire. While camping at the park months before the blaze, huge depths of forest litter and undergrowth, 2m deep, were visible everywhere. The fire risk was obvious. Locals told us Nat. Parks (and greenies?) had banned ANY hazard reduction burns for 30 years previous to the fire. Do people have to repeat their mistakes over and over before they learn? The country nervously awaits Spring when an unprecedented outbreak of wildflowers is expected. Mate, you just cant find any good news these days…except the wildflowers of course. Im sick at home, but have my equally sick daughter for company and the cat was curled up on my feet before, so life is good. Back to the problem at hand….All we need is a few politicians without a big yellow stripe down their backs to actually build new power stations…. Can we drum the cowardly ones out of parliament? That would sober a few of them up….imagine that as a spectacle on the parl house forecourt…. I hope you feel better soon. That will be before we get a change of politicians in parliament. What we need is a few politicians with the intestinal fortitude to stand up and denounce CAGW for the falsehood that it is, then to cut all subsidies to the ruinables, un-sign the Paris “agreement” and stop killing industry and business in this country and pricing electricity out of the reach of ordinary folks. The Paris agreement was never valid and still isn’t, to become engaged it had to get ratification by if I recall 55% of all the emitters. The US, China, India, and Russia never validly ratified it so it has never met that mark and is not yet in effect. We should be ignoring it. Watch the court case in California closely. It’s going to be interesting. Speaking of wildflowers, there are many of such that will not germinate until a fire passes over their environment. The quick sort of fire presumably, not the sort of firestorm we had around Marysville which was so hot it sterilised the ground quite deeply in places. Maybe this is democracy by urban legend? Well it will all end in tears when lack of power turns urban areas into 18th century slums/ ghettos and services collapse and disease runs rampant…..but i think that is how they want it to go, to get rid of the “useless eaters”. With all this malarkt, never forget that UN Agenda 21 is based around cramming people into mega cities to empty and protect the country side…. Comical. Such delusions are widespread unfortunately, including inside some governments. Do we have a new phenomenon, UVE (urban voter effect). Studies have shown that urbanites who wear scarves in summer have an impaired sense of climate. Di Natali took over the reins from Bob Brown, who should be remembered for his famous “Earthians” speech to the faithful. Google it and you will really understand how loopy he really was. Could cause cyclones to be less intense. You never fail us Ruairi, bless you! Now that global cooling has begun we should expect drier conditions over the next 30 years, but not necessarily more bushfires. Let’s forget that our biggest flood was in 1955, our biggest cyclone in 1899 and that the world’s biggest fire occurred in Victoria in 1851. Forget that The Federation Drought, beginning in the 1890s and peaking in 1902, was our worst drought. Never mind that infant Sydney barely survived in the face of the rolling super El Nino and monsoon failures, peaking early 1790s, which killed up to eleven million across India in the Skull Famine. Let’s assume you can live on a planet without extremes of weather by implementing a bunch of taxes and regulations aimed at CO2. Shouldn’t Di Natale be addressing his demands to the world’s population of termites? Especially since he’s not great at reasoning with humans. I was at high school in the ’50s and the weather was so extreme “they” needed to find a cause and find one that did THE BOMB. It seems our belief in a merciful Gaia and a wicked mankind is eternal. Seems to me that our current batch of politicians have all either drifted to the left or are left wing anyway just to appease and gain the inner city hipster yuppie vote . We don’t have a Trump like figure in oz and we haven’t suffered enough (apparently) for the sheeple to wake up to what’s going on , nothing will change , nothing will be fixed until its well and truly broken . So unfortunately for us it seems that’s what’s needed , vote 1 the greens next election and let’s speed up the inevitable and wake up the sheeple to exactly what these id1ots are up to and the consequences of blindly following an ideology that’s short on proof but big on scaremongering and rhetoric. Once it all implodes and the masses tar and feather the offenders that were responsible for ruining our country maybe we then can rebuild what was once the lucky country . I don’t believe that the politicians who support “climate change” UN IPCC agenda really believe climate changing is not natural. And there are of course politicians who mock their colleagues for pretending to be believers. No, it is an excuse for changing the world, turning nations into controlled from central HQ states long term, redistribution of wealth and profiteering along the way. We have a prime minister who was once employed by Goldman Sachs who has a son who was employed by Goldman Sachs who now has a investment capital company in Singapore that invests in Infrigen Energy Australia which was earlier a Babcock company in the US that was closed down for financial purposes. Goldman Sachs in the background. The transition to renewable energy is all about image, meeting the emissions reduction targets while capitalising on so called renewable energy ventures, a secret carbon tax in place preparing for introduction of emissions trading for wealth creation next. How could this be the lucky country now, our luck in avoiding too much damage has run out. I worked in fire surveillance on a firetower in the SW of Western Australia for 18 years. To give those who comment here an idea of the frequency of lightning caused fires in some fire seasons I will make reference to fire season 2013/2014, at least I think it was that season or the season before it. 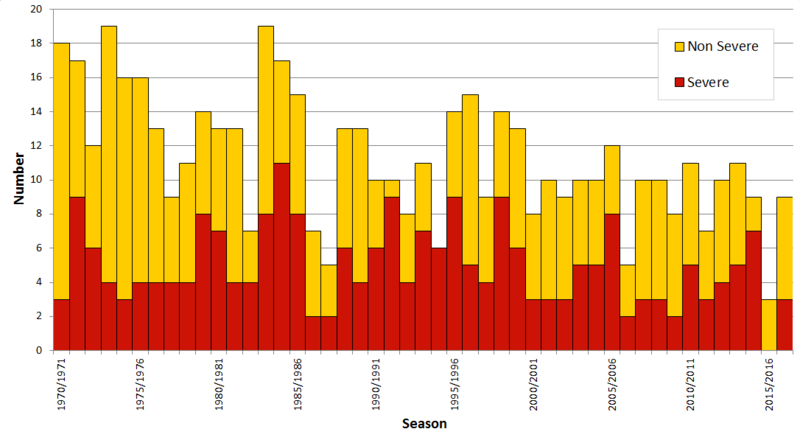 During that season there were almost 100 lightning caused fires in the extreme SW of WA. They occurred in an area SW of a line drawn from Bunbury to Donnybrook to My Barker to Denmark. So you can check that area for yourself. Only two of those fires made the media, because they were the only two fires that affected people or infrastructure. The others were all detected early and early suppression efforts contained then early. In fire season 2002/2003 one electrical storm resulted in over 200 lightning caused fires in the SW of WA. In some years of course there are only a handful of lightning caused fires. However fires will always occur. Whether they become significant or not depends on time to detection and suppression, fuel levels present in the location of the origin of the fire and prevailing weather conditions. We can’t control the weather, but we can control the fuel. Delete My Barker, insert Mt Barker. The majority of trees that have fallen are not native to the region. African Mahoganys, planted in their thousands due to their stately evergreen outlook have fallen in droves right across the north. The Catholic Church in northern communities like Kalumburu removed them years ago after some buildings were smashed. Cyclone Rosita in 2000 cost Broome half of the population of Mahoganys, and the weaker cyclones hitting Broome this year removed many more. Native deciduous and semi-deciduous trees fared very well, though branches on many Northern Australian and Queensland native trees snapped off. 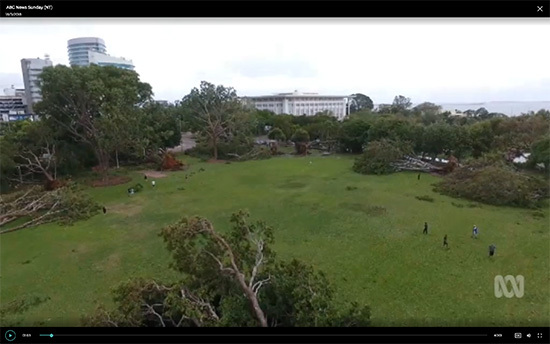 Cyclone prone communities should not grow large trees from places that are unaffected by cyclones if they don’t want damage during storms. On the other hand, we now have an enormous pile of excellent mulch. This is a drum I’ve been beating for years but I have no platform. damage and inconvenience caused by loss of power is a result of falling trees. Every council has a botanist on staff, What are they doing? Why not group fund another effort by JCU to come up with tree codes for the tropical coast? JCU staff do not have time to do this. They are fully occupied with attending funerals for the Great Barrier Reef. The poor things. Here they go to all the trouble to tell the climate what kind of weather to have on earth for the next hundred years. Then the climate, almost as if it is one of those hateful multiphobic climate change deniers, does as it wishes rather than as told by its betters. What will they ever do? It is a puzzlement. I would suggest they get a job working on a farm and live off the crops they grow and harvest for a period of five years. That would be an eye opening education. Although, it is highly unlikely they would survive because farm work is about as real as it gets. You work hard, hope for the best, and harvest whatever is left after the weather has done its thing. What you want or need is irrelevant. The environment doesn’t cooperate with you, you have to cooperate with the environment. What you actually get for all your hard work and long hours is all there is. We’ve also had stronger buildings since Co2 started increasing and if we follow the logic of consensus scientists if we reduce the levels of Co2 the buildings will be weaker . Fight fake science with fake science I say . Just make sure your fake science is the most plausible fake science possible! You know, I had to do a double take, my mind must have done a projection…for a moment I thought that chaps name was blowhard…not Boland….. If Di Natale is calssified as “centrist”, does that mean by extension that others in the already-wacky greens are edging towards the extreme end of things? And if so, can we get them classiifed as an extremist party? If so, presumably our Intel services already have files on most of the members…. Actually, reading the article, it reeks of a public knee-capping of Di Natale…..if so, we know who the king maker is….. So be it, if they ditch whiney man and put it a really rabid no holds barred Greenie leader, it will just hasten their demise. It will just confirm how disconnected from reality they are. As experts warn about extended fire seasons in Australia, Greens leader Richard Di Natale has linked the danger to Canberra’s position on renewable energy. ***David Bowman, a professor of environmental change biology, says analysis of recent events shows fire seasons are longer globally. “Joining the dots, this is consistent with climate change,” the University of Tasmania academic told AAP on Monday. “This is the new normal now – we need to get our heads around this. The classic example was the 2017 season in California where fires raged right through the northern autumn, Prof Bowman said. Australia Greens leader Richard Di Natale says the federal government has been slowing the transition to renewable energy “and Australians are bearing the brunt of their failure”. The president of the Australian Council of Environmental Dean and Directors says bushfires “well into autumn” will become increasingly common. “Given our weak efforts to reduce emissions globally – and especially in Australia – we will increasingly need to plan for catastrophic events and pick up the pieces following such events,” Associate Professor Grant Wardell-Johnson from Curtin University said in a statement. Climate change is lengthening fire danger seasons around the world, although the picture is not so clear for Australia, according to a new study. On first glance the findings suggest the continent that is so famous for bushfires bucks the global trend, but the researchers warn this may not be the case. They say the anomaly in the study’s findings is due to Australia’s highly variable climate. “We’re not seeing [the global trend] clearly in Australia because of a statistical problem, not because it isn’t there,” says Dr David Bowman, a professor of environmental change biology at the University of Tasmania. In a study published today in Nature Communications, Bowman and colleagues used global data to develop a fire danger index that could be used to detect trends in fire weather seasons throughout the globe from 1979 to 2013. “Since 1979 we see a small but significant lengthening of fire seasons,” says Bowman. The researchers found that over 53.4 per cent of the Earth’s vegetated surface, there had been an increase in frequency of long fire weather seasons. And they found that over 25.3 per cent of the surface, fire seasons had lengthened by 18.7 per cent. However the researchers could not pick out a clear signal of increasing long fire weather seasons in Australia. “It’s not what you’d expect because you’d think that one of the most flammable places in the world would be a place you’d logically see the trend,” says Bowman. He and colleagues argue that a key reason is likely to be Australia’s highly variable climate, which creates statistical “noise”, making it hard to see a clear pattern in the short time examined. I remember being floored when the bushfires at the start of Abbott’s PM period were pronounced freakish by the luvvie media because they occurred in early spring. Maybe it was just an opportunity to ridicule Abbott because he had joined his brigade to fight the fires, but for anyone living north of Nowra and south of the horse latitudes to be surprised by spring or even late winter fire conditions shows unforgivable ignorance. How do you not notice the brontosaurus in your elevator? Does he have to burp, break wind or do a tap dance to get your attention? Dry winters ending in August westerlies are common and deadly along the NSW coast and ranges. Start with 1895! September is the most regular fire month here on the mid-coast, though drought and westerlies in high summer are obviously worse when the conditions occur from time to time. The trick is to wait for any old event and call it new and unprecedented, even if it comes round with regularity. Even if the absence of the conditions would be more odd. To perform the trick you need a generation who don’t like to go outside and keep staring at small coloured screens when they do. And you need a centralised and corporatised media which is little better than an organ of government and globalist conformity. Cyclones in cyclone season in the north? Fires in early autumn in the south? Spring fire in the Sydney region? It’s all totally unprecedented…except for precedents. Any objections can be smirked away by Brian Cox or Neil DeGrasse-Tyson, who get all the hot gigs. Your cyclone is unprecedented, your fire is unprecedented, just as surely as man has propelled upholstery toward Mars. Argue and you will be the object of a smirk worse than a thousand FB unfriendings. Or screamed at in an ugly fashion as happened to my OH a while back when he quite gently made a point about so-called AGW. I found some of your writing made me laugh, despite the serious subject matter….’a smirk worse than a thousand FB unfriendings’! Indeed. Maybe that was a practice run for “Trump Derangement Syndrome”? Fire season getting longer but cannot be seen in the numbers. When the fire season gets very long, it becomes just one event as smaller parts blur into one. So, the paradox, the increase converges on unity. Feb 2012: ABC: Anna Salleh: Bring elephants to Australia? Australia could introduce large herbivores such as elephants as part of a radical biological solution to the problem of wild fires and invasive species, says one expert. The argument is laid out in a provocative commentary published in today’s issue of Nature. He says the sheer magnitude of the landscape makes short-term slashing and aerial spraying programs impractical, and biological solutions are needed instead. Bowman acknowledges many will think his idea is stupid and says he’s not committed to elephants per se, but says the challenge is on to find a more holistic solution to problems like grass fires. Bowman says the mistakes we’ve made in the past call for confronting solutions that need to be based on science not emotion and cultural prejudice. People need to ask themselves why it’s okay to shoot donkeys and camels but not horses, he says. So how come the camels and donkeys haven’t managed this? The whole cane toad thing wasnt enough for him apparently. What I cannot wrap my head around in all of this is the coming ‘embarrassment factor’ associated with all this, especially renewable power. Ten years ago, when I started doing what I do, I was like everybody ….. at that time ….. not now, when we have a relatively good handle about it. I believed in this new fangled power generation of wind and solar power, because that’s all I was hearing and reading, even though I had a background of more than 25 years of training, working and teaching in the electrical trade. Everywhere I looked ….. at that time they were saying that wind power and solar power could just replace coal fired power. Even at that time, I knew (because of that electrical training) that it would have to be based on actual generated and delivered power, and NOT Nameplate. So, I then calculated how much actual power was needed to be shut down in that coal fired sector. Having that, I could then work on replacing it with wind power. While starting out on this research, I came across what seemed to be an anomaly, (well, for me anyway) something I had not heard of or read anywhere and that was what turned out to be and what is now referred to as the Capacity Factor, (CF) the relationship between actual generated power and the Nameplate. You see, that CF can also be equated across time as well. So even though the CF of (say) 30% means a Nameplate of 300MW will only generate on average across a year the equivalent of 90MW. However, it is also the same as saying it only generates its maximum of 300MW for 30% of the time, averaged across the year, so, in effect, a little more than for seven hours a day, some days more, some days less, but an average across the year of only 7 hours or so a day. No, that information at that site can’t be right. So, check somewhere else, and that confirmed the first site. I ended up going to a (very) large number of sites. I would do the maths, and then do it again. Go to bed and sleep, check again. Repeat. Repeat. Then, take my heart in my hands and write about it. That was the hardest part, because try as I might, no one was saying or writing it anywhere. That is what gave me the most agony. Even though I had done the maths a hundred times, I still suspected I was somehow wrong, or missing something. Writing it down meant that it was there forever. I had the idea that after a while someone would prove me wrong, show me what I missed. There it was. I would be finished forever. Now, I was a relative nobody, just an isolated blogger, but I was acutely aware of just how that might go for me if I was ‘found out’. However, every single time I checked from that point on, always looking for my (perceived) mistake, I found out I was right all along. But back then, I was really concerned for months. Now, here we have people like Senator Di Natale, and he’s not the Lone Ranger here, as they all do it, some more strident than others. But unlike me, the ‘nobody’, he has credence. (well with some people anyway) He has a following. He has what he thinks of as respect. What’s going to happen to him, and to all the rest, when they find out that their beloved renewables are just a crock of $h1t, and not only cannot deliver, but cannot replace their vilified coal fired power. Once the truth gets out, people are going to point at him, and all the others, and laugh out loud ….. for the rest of their lives. They have nailed their unverified, unchecked, uninformed, untrue, colours to the mast in a very highly public manner. But then again, I suppose they really have no conscience. Water off a duck’s back. Now that will be embarrassment on an Industrial scale. Tony we are all glad that you have done what you have. It must have seemed like you were leaping into the deep end. However as I look daily at the nem-watch site, I see everything that you post being confirmed. I find your posts most informative. I only hope that your comment “Now that will be embarrassment on an Industrial scale.” becomes a prophecy fulfilled. Thanks again for what you do, and I look forward to your regular post on weekend unthreaded. All the ( disposable ) pollies who have been Collaborators with the CAGW mess will be publically villified and thrown out, but the real orchestrators will be protected as the public will have seen a publuc ” blood letting”. What we need to do is out those who pull the strings behind the scenes so the publuc can see who they are…. The story of the prime minister’s son’s energy business investments and the boost in share value following the federal government pricing arrangements etc in early 2016 has been published by the Australian Financial Review and others, but like so many mysteries the story went no further. As compared to an allegation that a former PM punched a wall alongside a female student when there were no witnesses and his student political opponent said nothing until he became an opposition leader. It is a pity that the Turnbulls were allowed to breed. They are playing a different game. Get elected a couple of times, maximise benefits and allowances, claw up the food chain if possible, qualify for max pension, retire/lose seat (doesnt really matter), move into ambassador/consul roles, lobbying or board positions with companies you smoozed while in politics. Embarrasment pfffft! they are long gone and counting their money. I expect Jay Weatherill will be very embarrassed when he eventually gets his monthly pension of $23,417 (indexed as well); and pigs might fly. His ego is about as battered as it can be right now. There is no accountability beyond the last election. So Jay will sit in opposition for at least another two years taking his monthly salary of $15,583 while ensuring he qualifies for the maximum 75% of his top salary. He will be able to blame the unfolding economic mess in South Australia on the mismanagement of the Libs. At least South Australian pollies have to hang around and serve time before the golden eagle lands. Queensland pollies are incentivised to get out as soon as they lose power as their pensions are based (or were) on the average income of the last three years; recall Anna Bligh’s haste to depart the parliament after the Labor loss there a few years ago. During our time at Wagga Wagga (86 to late 91) while I was teaching the trade, TV was pretty sparse, with just the one Commercial TV channel, and the ABC, so we (my good lady wife and I) would marvel at the TV ads oriented towards farmers and graziers. One of them was for Roundup, and the stern farmer type sounding voice said that it was used for the control of woody weeds. My good lady asked what they referred to as a woody weed, and my reply was, umm, trees! I heard on the abc, ( I will not honour it with the use of capitals) the devastating news that only 50% of Ausralian adults, brush their teeth twice a day. Why is this even newsworthy, let alone headlines. It appears that anything is news apart from the failing CAGW scam. That’s better than this bit of “unprecedented ” alarmism ! Only 50% brushing twice daily!!! That must fall into the “catastrophic” bag. We had a pretty big thunderstorm here last month. The wind exceeded Darwin’s 130 K/H over a moderate area, a few kilometres long by over a couple of kilometres or so wide. We had hundreds of very big trees down, 5 across my road, in the 2 kilometres to the main road. We spent an hour with a dozen other residents clearing enough to get through to help our son, who was trapped with 5 other cars, with trees down behind & in front of them on the main road a few of kilometres away. They were unlucky as the road was blocked, but the gum trees to the windward side were still shedding branches 300mm & more in diameter. His ute although still drivable & operational, is now at the panel beaters. The repair quote was $6500, & his was one of the least damaged. This was the first as strong as this for quite a while. We used to get such & stronger blows regularly in thunderstorms about 20 to 25 years ago, with much more damage to buildings. The fact that they were regular meant most of the weaker trees were already down, so there was less disruption to the roads. Most of us would have been glad to have as little damage here as this little blow has done in Darwin. So would our council & Energex. The council had a team of about 50 staff & contractors for 6 days just cleaning up the road verges. I counted 6 cherry pickers & crews from Energex in just a kilometre of main road replacing power lines. There were many more around the area. So what they are saying is, THIRTY YEARS AGO, when CO2 was 353.69 ppm, (love the precision there for a worldwide value… ) there was a larger and more destructive storm? Which is VERY strange because a quick Google shows that there were NO cyclones in the NT for the period 1986 – 1989 and EIGHT Cat 3, 4, 5 cyclones since 1989. Methinks someone is spreading the manure WAY too thick. And where do they get off calling if a Cat-2 anyway? I checked BOMs data and the max singlebgust was 128 km/h, and highest wind 92 km per hour. Sorry, that’s a CAT-1, possums. Max Hype must be the ABC’s leading announcer? this Economist editorial wasn’t easy to access, so posting it all. OIL shaped the 20th century. In war, the French leader Georges Clemenceau said, petroleum was “as vital as blood”. In peace the oil business dominated stockmarkets, bankrolled despots and propped up the economies of entire countries. But the 21st century will see oil’s influence wane. Cheap natural gas, renewable energy, electric vehicles and co-ordinated efforts to tackle global warming together mean that the power source of choice will be electricity. Oil is a wonder fuel, packed with more energy by weight than coal and by volume than natural gas (both still the main sources of electricity). It is easy to ship, store and turn into myriad refined products, from petrol to plastics to pharmaceuticals. But it is found only in specific places favoured by geology. Its production is concentrated in a few hands, and its oligopolistic suppliers—from the Seven Sisters to OPEC and Russia—have consistently attempted to drip-feed it on to the market to keep prices high. Concentration and cartelisation make oil prone to crises and the governments of oil-rich states prone to corruption and abuse. Electricity is less user-friendly than oil. It is hard to store, it loses its oomph when shipped over long distances, and its transmission and distribution require hands-on regulation. But in every other way, it promises a more peaceful world. Electricity is hard to monopolise because it can be produced from numerous sources of fuel, from natural gas and nuclear to wind, solar, hydro and biomass. The more these replace coal and oil as fuel for generation, the cleaner it promises to be. Given the right weather conditions, it is abundant geographically, too. Anyone can produce electricity—from greener-than-thou Germans to energy-poor Kenyans. True, the technologies used to produce electricity from renewable resources, and the rare earths and minerals that some, including solar panels and wind turbines, rely on, could be subject to protectionism and trade wars. China, which produces 85% of the world’s rare earths, sharply tightened export quotas in 2010 with OPEC-like zeal. America and the European Union have slapped tariffs on Chinese solar-panel imports. Yet the vital substances involved in generating and storing electricity are not burned up like oil. Once a stock of them exists it can for the most part be recycled. And, even if today’s output is concentrated, for most materials the planet has undeveloped deposits or substitutes that can thwart a would-be monopolist. Rare earths, for example, are not rare—one of them, cerium, is almost as common as zinc. The tension is inescapable. On the one hand government policy should press forward with the transition as fast as it can. On the other, a rapid transition will cause upheaval. Expect the big consumers, especially India and China, to force the pace. I generally agree with the direction of these comments. However I do not see a great need to rush. Base decisions on economic merit not subsidy driven haste. I find it all a bit hard to fathom. The Electricity Era is now, not in the future. Electricity cooks our food, heats and cools our homes and buildings, provides lighting, powers factories, and transport (trams, trains and trolley buses). Wind, Solar and Biomass are not good sources of electricity and never will be. Hydro is good but limited in availability. Coal, Gas and Nuclear are the future of electricity, not renewables. Investors in Oil assets need not worry. Trucks, Ships and Aeroplanes will not move without it. Also cars outside the cities. Electricity refines our metals. It’s the only way of refining aluminium and it’s important in refining metals like Cobalt where it’s the final stage of extraction from it’s salts. Cobalt is used in the production of Li-ion batteries, like the ones needed to power Electric Vehicles. The refining needs big gobs of steady electric power which windmills and pv cells can’t provide. Big hydro, big coal and big nuclear can. Can you imagine the scream that would go up if governments started building subsidised petrol stations, yet the ratbag fringe are screaming out for subsidised electric charging stations. If we could just stop politicians pandering to the ratbag fringe, trying to buy their votes, we might get some sense back into our lives. and what happens when a “rare earth” element such as, say, Cobalt becomes too rare to meet demand? Now, Cobalt would not be used up by going into batteries, it can be recovered. But what if the quantities able to be mined and recovered just cannot meet demand? It’s already risen from US$2000.00 per tonne at start of 2016 to US$81,000 per tonne, end of 2017. Apply Nett Future Value to that for, say 10 years hence with all the world’s car makers ramping up for production? Maybe we should quote another Green mental giant? Everyone heaved a sigh of relief when the ink dried on the Paris Agreement. Finally, we thought, the world’s leaders had committed themselves to doing something about climate change. But behind all the fanfare, scientists have not been quite so optimistic. And now, as of this year, they’ve arrived at a startling consensus: the Paris Agreement is deeply flawed – and we’re going to need a better one. Scientists from all quarters are sounding the alarm. In 2014, fifteen scholars questioned the credibility of BECCS in the pages of Nature Climate Change, noting that “its widespread deployment in climate stabilisation scenarios might become a dangerous distraction” from the imperative of reducing emissions. The following year, another 40 scholars stated in the same journal that reliance on negative emissions technologies – not only BECCS but also other ideas like direct air capture and enhanced weathering – is “extremely risky”. Many more have come forward with the same conclusions. The consensus on this is now rock solid. Last month the European Academies’ Science Advisory Council, a body that brings together the national science academies of EU states, published a report condemning the Paris Agreement for its reliance on BECCS and other negative emissions schemes. The Council urges that instead of betting on speculative tech fantasies, we should turn to more down-to-earth plans like regenerative farming and reforestation, while – most importantly – making aggressive cuts to emissions. If we take BECCS out of the equation, things get more serious. Rich nations will need to reduce their emissions by more than 10 percent per year. The tricky bit is that while we can manage some of this by investing heavily in renewable energy, it’s ultimately going to require that we step off the treadmill of endless economic growth and consumerism – and fast. Our leaders are desperate to avoid this conclusion. But the science is clear: we can’t rely on technology alone. It’s time for a new economic system. For the Paris Agreement to work, this truth needs to be at its heart. Well there you go. I thought the economic folly of wind and solar generators on the grid was the way of saving the planet when it has been BECCS. So why all the wind and solar generators? Profiteering by investors lured into the business by government provided taxpayer funded subsidies and favourable price fixing arrangements. Part of the problem here is that the mainstreams own view of cyclones anti-cyclones and hurricanes is as equally nutty as this Druids. The mainstream view has the energy for anti-cyclones comes from luke warm water. Thats pretty crazy right? Energy doesn’t go from being diffuse to being focused like that. This is a reversal of energy flux densities tendency to disperse. The real explanation is to do with the voltage difference between the ionosphere and the deep earth leading to this electricity trying to earth itself. And when it cannot earth itself it will swirl around and around until it does. But if there are taboos in recognising the great buildup in capacitance in space (and in the atmosphere) then people are forced into thinking that the energy from luke warm water can be gathered in such a way as to express more joules then an atomic bomb every few seconds. Its back to aether-denial again. The aether can conduct electricity to some extent. But its a resistor as well. So there is this great buildup in capacitance from the photosphere of the sun all the way to where we are. An electrical current is the flow of electrons or ions …. and protons are like an ion of hydrogen. So the solar wind is itself a direct electrical current, but on top of that you have this electrical pressure buildup from sun to earth all the way. Two types of electrical energy coming at us. I don’t pretend to know my terminology here and the phraseology I use is just my own and not how an electrical engineer might talk. The Greens relish every weather-related disaster, sadly that’s true. Wildfires in Australia occur overwhelming in remote areas of the NW and probably always have. If you look out while flying over NW of WA you can see large fires in remote areas but they never make the news. From what I’ve seen Annie those fires are subsidised and paid for by the govt , something to do with carbon abatement or carbon farming . They get paid to burn because the new grass stores carbon but just can’t quite get the logic because of the burning releasing the previous years carbon build up . It is interesting that the stations in the NT get a government match issue. And those proper “will light” ones too. Not the usual FUM* brand we have to buy that are almost guaranteed to not light. That is land management Annie, aboriginal style. Geez, if the Fed and various state governments are doing everything they can to “slow down the transition” to ruinables, I’d hate to see the result of them putting an effort to speed it up! It’s crook enough already as far as unreliability and cost is concerned, no need to make it any worse. Don’t give Turnbull or the ALP any encouragement to ramp up their efforts, the country’s sinking fast enough already. The Federal Emergency Management Agency, the federal government’s first responder to floods, hurricanes and other natural disasters, has eliminated references to climate change from its strategic planning document for the next four years. That document (LINK), released by FEMA on Thursday, outlines plans for building preparedness and reducing the complexity of the agency. The agency’s Strategic Plan was issued with the signature of Administrator Brock Long. My comment (28.3.1) in reply to Another Ian (28.3) is in moderation for a couple of hours now, and I can’t figure out what the word was. The only one I could see might be the commercial name for Glyphosate. Let me check that for you. ROUNDUP. That didn’t work very well. I think I might have the word isolated. It starts as ….. spar ….. and ends with ….. se. It means spread out. That word also contains the euphemism for, umm, fundament, hence a naughty word, hence the moderation, most probably an automatic function would be my guess. So sparse gets you in the sin bin ! Oh I see it does get you into moderation but why . Does that mean that Yanks have finally learned to spell properly? Technological innovation could replace today’s solar panels with coatings as cheap as paint and employ artificial photosynthesis to store intermittent sunshine as convenient fuels. And systemic innovation could add flexibility to the world’s power grids and other energy systems so they can dependably channel the sun’s unreliable energy. Varun Sivaram is the Philip D. Reed Fellow for Science and Technology at the Council on Foreign Relations. He teaches “Clean Energy Innovation” at Georgetown University, is a Fellow at Columbia University’s Center for Global Energy Policy, and serves on Stanford University’s energy and environment boards. He has advised both the mayor of Los Angeles (Antonio R. Villaraigosa) and the governor of New York (Andrew Cuomo) on energy and was formerly a consultant at McKinsey & Co. He holds a PhD in condensed matter physics from Oxford University, where he was a Rhodes Scholar. PV Magazine called him “The Hamilton of the Solar Industry,” Forbes named him one of its 30 under 30, and Grist selected him as one of the top 50 leaders in sustainability. A new analysis is shedding light on drought in Mongolia, both past and future. By studying the rings of semifossilized trees, researchers constructed a climate history for the semiarid Asian nation spanning the last 2,060 years — going 1,000 years further back than previous studies. It was suspected that a harsh drought from about 2000 to 2010 that killed tens of thousands of livestock was unprecedented in the region’s history and primarily the result of human-caused climate change. But the tree ring data show that the dry spell, while rare in its severity, was not outside the realm of natural climate variability, researchers report online March 14 in Science Advances (LINK). The recent dry spell was the severest in recorded history. But the rings showed that an even more severe drought took place around the year 800, long before anthropogenic climate change began. Still, computer simulations suggest that about a third of the recent drought’s severity could have been caused by elevated temperatures linked to climate change, the researchers found. The finding is consistent with studies on how climate change has affected other recent droughts in South Africa and California. 1 Department of Geology and Geography, West Virginia University, 98 Beechurst Avenue, Morgantown, WV 26501, USA. 2 School of Geography and Development and Laboratory of Tree-Ring Research, University of Arizona, AZ 85721, USA. 3 Department of Statistics, West Virginia University, Morgantown, WV 26506, USA. 5 NASA Goddard Institute for Space Studies, New York, NY 10025, USA. 6 Department of Forestry, National University of Mongolia, Ulaanbaatar, Mongolia. 7 Harvard Forest, Harvard University, Petersham, MA 01366, USA. Cyclones are decreasing in Australian waters to a level not seen since the Renaissance. Makes sense. Being as the suns energy is at a bit of a low ebb. Ah yes, but correlation doesn’t necessarily prove causation. To me that data could show, equally, that the Australian recovery from the “Little Ice Age” is proceeding much more slowly than the N Hemisphere’s recovery. And if your warming rate is half ours, why is the BOM freaking out over the temp rise at all? The Government is taking the Rachel Hunter approach to banning oil and gas exploration. It may not happen overnight but it will happen. The only question, the Prime Minister has now made clear, is not “if” but “when” and “how” the transition will work. We don’t know yet whether it will be a transition of five, 10 or 20 years. But one thing we do know is that she won’t be able to keep both Greenpeace and New Zealand First happy on this one. Her hugely symbolic and unannounced decision to appear in front of Parliament to receive a petition from Greenpeace to end oil and gas exploration just about said it all. The Government was actively considering their request, she told up to 50 climate change activists whom she described as “our conscience”. And if Ardern’s appearance didn’t quite say everything, when she was asked at a post-Cabinet press conference if a decision had been already been made to move on from fossil fuels and she said “the world has”. But the Government is going to set in law a goal for zero net carbon emissions by 2050. Greenpeace and the Greens want the accelerator planted (on the EV) to get decisions made and the framework in place to achieve that goal. Banning future exploration of fossil fuels is basic. Were Greens ever a danger to citizens it is in their desire to preserve forestation near vunerable communities. Every time there is a major fire, such in the Blue Mountains or in Victoria, not to mention the South Coast of NSW there is major loss of life and property. Although this time they got out in NSW, so thank God and the civil defence, no one died. However where were the fire breaks, land clearing, sprinklers on rooves, blocked empty gutters full of water, local fire truck and so on? A friend who went to the aftermath of the Victorian disasterous fires said if faced with them, he would have turned around and driven off. None of the houses were fire resistant, just fibro and corregated iron. The leaf and branch litter was high into the trees with a huge calorific value, beyond any abilituy to reduce it with water. Every plant was a native, so became incandescent as the ember front advanced, with crown top fires behind. No doubt there will be the usual enquiry and some poor firey will be told he ‘should have known’ and stopped the flames. Clearly the event was unexpected and presumably not predicted by any forcast good enough to say where this fire would break out. One close to me had the experience of a fire going right through her rural village. The whole place is now surrounded by grazed land, park land or forest with no litter. bird friendly grevillias and native gum trees. These fringe towns need audit and mandatory fire clearing and survival education. It is useles to call 000 and expect the firey to show up and put these fires out without serious loss unless prepared yourself. Crying climate change is just sophistry to divert attention from real problems. Our communities need people capable of addressing reality,particularly those funding and controlling fire prevention services. On this criteria the Greens are a libility to our society. More fodder for the green Druid . Go easy on Druids – Chiefio is a qualified one! Few people know it, even many who call themselves “Druid”, but it basically just meant a trained person. There were specialties too. Law, medicine, and bards who basically recorded and sang the histories. So for that reason, one can be a technical Druid, or just a song & dance Druid. I’ll leave it for others to decide just what category a “Green Druid” would be in as that is not one of the traditional specialties. Original categories did include augury or the art of divination, so I suppose a “green” Druid might be from that order. Just guessing about the future from things like dead birds guts and overflights of birds. Or maybe they are from the singers of songs group. 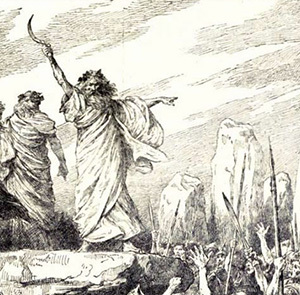 FWIW, there are many folks who call themselves Druids and really have no clue about the history of it or what it really is. Most of them just like to dance naked in the trees at the vernal equinox. I’m OK with that, but it really is just a tiny little side show to the whole thing. OT, Great article over at Paul’s place. I saw that yesterday….recommend it highly. If elected premier of Ontario, new Progressive Conservative leader Doug Ford says he will get rid of the carbon cap-and-trade system and make sure millions of dollars stay in the province rather than heading for California or Quebec. The provincial government refuses to say whether Ontario companies were big buyers in the first international auction for carbon permits, sending cash to Quebec or California for the right to emit greenhouse gases. We’ve gone in expecting to be buyers and payers. “Based on estimates of the number of allowances required from outside Ontario, and the forecast prices, Ontario businesses will pay approximately $466 million for Quebec and California allowances by the end of 2020, money that will leave the Ontario economy,” Ontario’s auditor general Bonnie Lysyk estimated in 2016. Now that there’s actual data, I asked the provincial environment ministry for it Monday morning. How many permits were sold in each of the three jurisdictions? Late in the day, I got an emailed response, unexpectedly from Ballard’s press secretary — a political person, not a civil servant — that went on at length about how the carbon market works but didn’t answer the question. “The independent Western Climate Initiative, which administers the joint auctions, keeps details regarding the number of bidding participants, and how and when they choose to bid confidential to preserve the integrity of the auctions,” was the key line in the email from Anna Milner. That’s fine, I replied. I’m not asking which companies bought the permits, just how many went to each jurisdiction. Can you explain how that would harm the integrity of the auctions? For its part, the small Western Climate Initiative organization in Sacramento said the information I was after resides in each of the three governments. Now, if Ontario companies do send cash to California and Quebec, that’s a feature of the system, not a bug. It means Ontario businesses think paying for reductions elsewhere is cheaper than reducing their own emissions, so they’ll be better off just buying the permits they need. There’s a reason cap-and-trade used to be the conservative, business-friendly answer to climate change. Launching a North American carbon market was even part of the federal Conservative platform in 2008, combining the magic of markets and the benefits of free trade. Ontario might-might-might even be a net profiter on this. Maybe the wealthy in Beverly Hills are subsidizing us instead. But until we can find out for sure, which might never happen, opponents of the climate-change policy can keep trashing it, unimpeded by better information the government has but won’t let us see. no wonder the NYT mob took flight to warmer climes! A powerful winter storm is barreling toward the Big Apple, bringing below-average temperatures to the region for the start of spring. New Yorkers will celebrate the changing of the seasons with a high of 39 degrees and low of 29 starting Tuesday morning. And those temperatures quoted would be Fahrenheit. 2018 YTD ACE for the southern Hemisphere is at 93% of average. So below “normal”. Last year (2017) the ACE for the southern hemisphere was at near historic low of 47% of the average. For 2017 despite a “hyperactive” season for the northern hemisphere the Global ace was only 80% of the average. So also below “normal”. YTD (2018) Global ACE is 113%. So 13% above average. Or above “normal” but the year is young. Amazing what numbers can do to expose liars and hyperbole about weather being climate. Gee, I never met a druid before, much less one who can speak authoritatively about the weather. A green druid is even harder to find, at least until this one popped up on my favorite blog. Of course, as usual with those who speak authoritatively about things they know nothing about, this one knows not a thing about weather or climate. It’s beginning to be a game of one-upmanship with these self appointed experts. Each tries to outdo the previous ones. My head starts spinning when I try to count up all the failed climate and weather finger pointers. I sometimes think I would prefer a plague of locusts invading my neighborhood to this constant parade of…well Jo would ban me if I said what I’m thinking. For some real weather try this — California’s central coast is bracing for as much as 10 inches of heavy rainfall with mandatory evacuations being ordered ahead of the storm everywhere the fires of just weeks ago burned everything in front of them driven by unprecedented winds. The expected rain is also being called unprecedented by some. One source called it the river storm. The actual term and it’s meaning ae here if you don’t recognize it. Isn’t it wonderful to be on the rollercoaster ride of one unprecedented disaster after another? Probably not, except if you’re a news outlet because then you get to use all the sensational and superlative terms to describe the fire and the rain where instead you should be more circumspect and just report the facts. Tee hee! I’ll never tell anyone that the weather does as it pleases and cares not for what we think or what we want. It does look bad and I’m not making light of what will be a real disaster right after the fire disaster and the first rain that washed out so much and did people so much harm. I am poking fun at those who speak when they’re ignorant, try to make sensationalism out of tragedy and any other description of someone who takes advantage of tragedy to puff up their own heads and their importance when they have so little importance in reality. Don’t forget to show the hysterical plant food doomsdayers the record for Onslow the cyclone capital of Australia whenever they’re dribbling on about extreme weather events nowadays and if anything Gaia has gone somewhat quiet of late but that will change again no doubt.